Ads in present day society are certainly very different from older ads in a number of respects. Advancements in technology alone creates a much different feel. Even the language has changed drastically. Advertising techniques that were effective 40 or 50 years ago would not have the same impact today. I decided to delve into the topic of how advertising has evolved through the years. Lego is a classic toy that almost everyone remembers playing with in his or her childhood. Lego was founded in the 1930’s in Denmark. The name “Lego” is derived from a Danish word that means: play well. An early Lego commercial (from the 1950’s) can be seen below. This ad definitely seems to be more educational and informative than typical ads today. It is very focused on outlining the purpose of Lego and the type of things you can do with it. Due to the limits in technology, they really had no choice but to rely more on language. They were not able to present the ad in colour, and they did not have the flashy animations that we have today. A lot of this information was also conveyed through the use of direct assertions, which are statements about reality. At one point, the voice over states, “build hotels, animals, people, boats, skyscrapers and more!” A lot of the information in this ad is conveyed through a song about Lego. This song is quite slow moving and the words are clear; you have plenty of time to process the linguistic information. There was also some repetition in this ad, which is characteristic of educational messages. 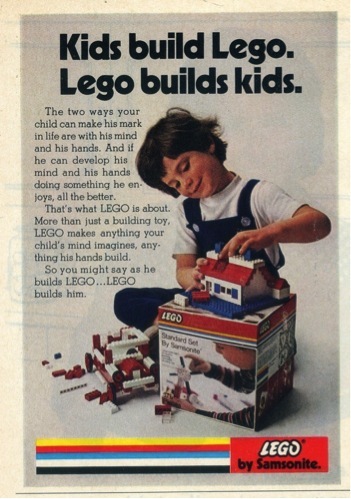 It was mentioned more than once that Lego is used “one by one.” I wonder whether the educational style would still have been prominent in advertising at that time if technology had permitted them to use more persuasive techniques (e.g. flashy graphics etc.). It is actually relatively similar to the ad from the 1950’s. It is even presented in a song format. However, the song format has changed. This commercial shows more of a rap style, while the 1950’s commercial used the tune of This Old Man (Knick-Knack Paddy-Whack). The language has changed as phrases like “word up” are used, which you would not find in the previous commercial. This ad also seems to focus less on showing how to build Lego “one by one” and mostly shows the kids playing with fully built Lego creations. In the more current Lego commercials, there is definitely a greater focus on visual elements and animation. In commercials like this one, the Lego characters are animated so it looks as though they have facial expressions (in some ads they are even animated to look as though they are talking). In this Lord of the Rings Lego commercial, there is even a brief animated battle scene; it is not just a kid moving each individual Lego piece or character. This ad seems to move in a more persuasive direction. There are a lot more visuals, moving images and fast editing. The final ads that I would like to discuss are print ads. The first is from the 1970’s, and the second is from the 2000’s. 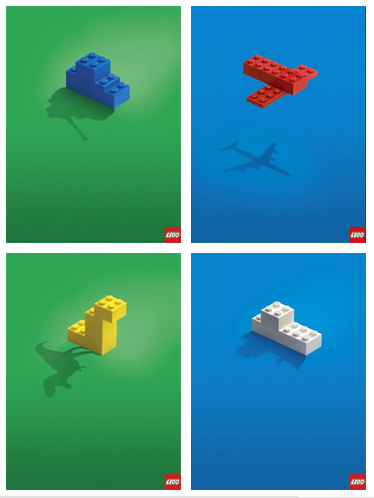 Both ads focus on Lego and the imagination, but they do so in very different ways. The earlier ad focuses on language. Its reads, “more than just a building toy, LEGO makes anything your child’s mind imagines, anything his hands build.” The very popular ad from the 2000’s conveys basically the same message, but no text is used. Instead, it is more of an implication. It implies that with Lego, you can create anything by using your imagination. I also think this is a fairly strong implication that is likely to be consistent across audiences. This progression through the years really shows that today we rely less on explanatory language in advertisements. Fewer things are explicitly stated, and we allow the audience to draw their own conclusions in order to create a more memorable experience. Do you think that our purchasing behaviours would be different if all ads today were more educational than persuasive? Really, it is the massive amounts of advertising that we are presented with these days that makes persuasion necessary: it is a constant fight for out scarce attention. I feel like people today don’t have the time, or don’t want to expend the mental effort to analyze an endless stream of language heavy, educational ads. In a world of too much choice, are we less educated about the products we purchase?